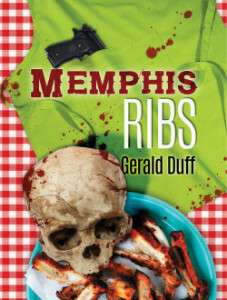 My friend author Gerald Duff shares the story behind the writing of his tasty new novel Memphis Ribs, which Entertainment Weekly calls ‘A tangy tale of murder, gang warfare, crack cocaine, and barbecue.’ I’m sucker for a great thriller and for barbecue, so this was a home run for me! When I wrote my novel Memphis Ribs, I did it for the same reason that all writers take up a task that lasts so long and uses up so much electricity. I was mesmerized by the topic, in this case my trying to understand the essence of the Bluff City where I had come to live for a spell. And it was a spell, because that’s what Memphis casts upon those who come to live with her. Memphis is an embodiment of the central paradox of the South. It is both tight and loose, and so are Southerners. Memphis has more churches of every denomination, conducting more worship services, attended by more of the faithful, than any comparably sized city in the nation. Memphis also has more low dives and honky tonks, more high and low bars, more prostitutes and drug houses, more robberies and gang shootings, more muggings and murders, just generally more of the fast life, than any other metropolitan area in the country. If Nashville, Tennessee’s richest city, is about the greed for money and the drive to make it, Memphis is about giving in, abandoning all hope, and having a good time. Memphis has suffered from calamities over time, including a yellow fever contagion which decimated the city in the nineteenth century and the assassination of Dr.King in the twentieth century which dealt the finishing blow to Memphis’s status as a contender in the big world of growth and commerce. For the commercial hopers and city planners, these disasters were apocalyptic, but for the writer they created a climate and culture conducive to dream, disillusionment, regret, and loss. The advantages for a novelist are clear and compelling. All is vanity, endeavor is doomed, and success is fleeting, evanescent, and gone. That’s the country where a novelist feels most at home. How all this influenced me as a chronicler of a fictional pair of police detectives – one black, one white – trying to solve some crimes in the Bluff City is clear enough. Memphis and its contradictions and energies and despair and humor emboldened me to try to capture in fiction some of its toughness, violence, obsession with barbecue and beautiful women, its racism and restiveness, and its hard-edged hilarity. I tried to do so by casting as a Memphis homicide cop a man in North Mississippi I had come to know. He was an independent cotton farmer, a Vietnam veteran who wasn’t outwardly bothered by his year in that war as a combat infantryman, and a man completely at ease with himself. He drank copious amounts of bourbon without seeming to become drunk, he loved his wife, and he had many friends, black and white, who admired and gave him great room and latitude. His fictional partner in the novel knows him to the core. All I’m trying to do in Memphis Ribs is to show how Danny M. would act if called upon to sort out some crimes in the Bluff City. In my attempt, I hope I’ve captured some of the gut and soul of that city on the big river that flows through the heart of America.